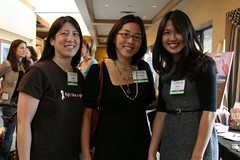 Here are some of the fabulous bloggers I met at BlogHer Boston (Burlington, but let's not split hairs). I was a bit nervous and tentative about going, but after arriving, I suddenly felt like I belonged amongst the hundreds of Twittering, passionate blogging women! I even put up two posts delayed by travel last week during the first session. Check out the twemes of the event (Twitter and Flickr!). Sandy at Momisodes. We live in the same state and we finally got to meet! And yes, she really is that pretty in real life. 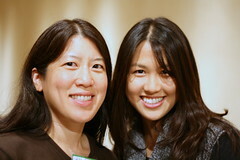 Christine Koh (center) of Boston Mamas and Posh Peacock. Christine liked this photo for the Asian girl power. 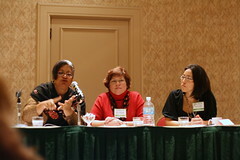 Candelaria Silva (left) of Good & Plenty and Susan Getgood (center) of Marketing Roadmaps (new URL). I've worked with Susan before with HP Photo Books and it was great to finally meet her in person. Tania of ChickyChickyBaby. The one and only! Catherine at Her Bad Mother. 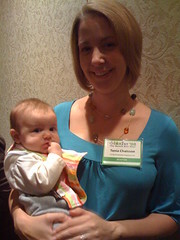 Another famous blogger with baby in tow. Katie aka MotherBumper, fellow kirtsy editor. Meredith at Picket Fence Post among many other blogs, who I met previously at her book signing. Annette at Catnip and Coffee. Alice at Do the Yak. She works at MIT! Lydia at The Perfect Pantry. I know nothing about food blogging, so if you're interested, go check her out. View more Thursday Thirteen participants.